Weddings have been around for as long as we can remember. Hence all of the wonderful traditions that are part of the package. From the bride’s farther giving her away, to our favourite, the beautiful dress. Getting married is a super exciting process however, it’s not all rainbows and puppy dogs. 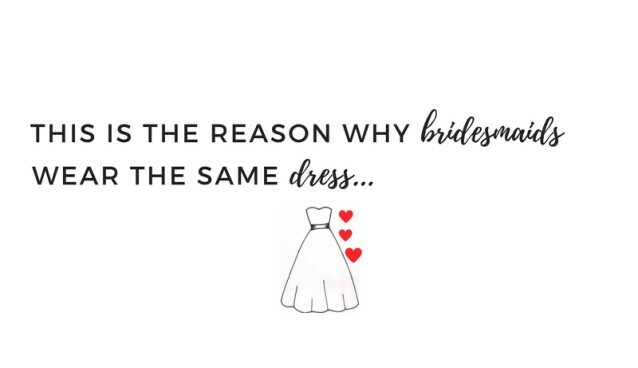 For example, trying to find the perfect dress which matches all of your bridesmaids skin tone, body shape and fashion interest is probably the most stressful task you will ever have to carry out. So, have you ever stop to wonder why we do this to ourselves, and why this actually quite bizarre tradition even exists? In Roman times bridesmaids were there to help ward off the demons or ex-boyfriends. The idea was, the bride would surround herself with decoys so that when either the evil spirit demon creature things. Or ex-boyfriends appeared to try and disrupt the wedding, they would be confused to which lady was the bride.